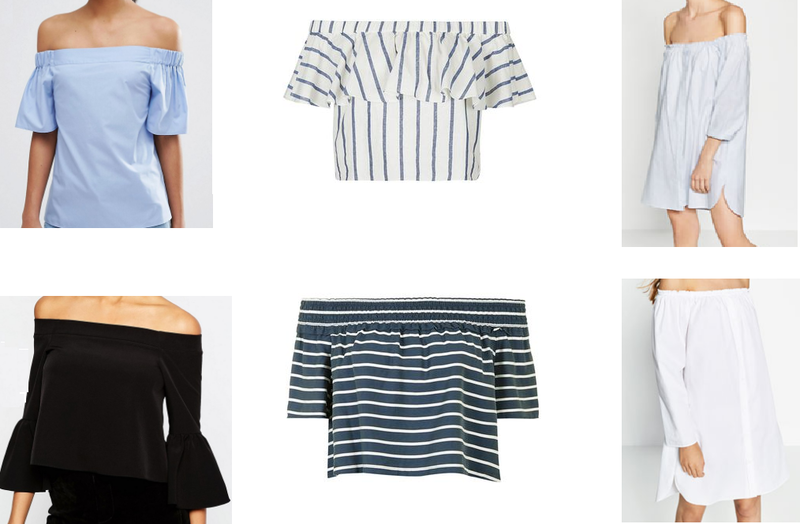 Off the shoulder tops and dresses are huge essentials to the wardrobe this summer. I would have one in every colour if I could. Well by that I mean light blue, black and white. This lil black dress was a bargain from ASOS. It’s only a jersey material. Of course, you can get sturdier materials or more relaxed, laid back styles like this one. I have my eyes on a sky blue off the shoulder top from ASOS which I am going to purchase for my holidays. It will look great with a white skirt I have had sitting in the wardrobe since last summer. There are so many different styles. Bell sleeves, ¾ length sleeves, short sleeves, frills, and cropped. So versatile and easy to style. Some of my favourite picks are below. The left, ASOS, the middle, Topshop and the right, Zara.